It has been a challenging start to 2019 for real estate investment trust (REIT) investors. At the start of the year, the REIT indexes zoomed higher. The last few weeks have investors wonder if the party is already over for the year. The financial media is placing blame in many places including trade wars, slowing growth and interest rate uncertainty. Many believe interest rates on the long end of the yield curve could rise with the growing Federal deficit. Which if true does not give confidence in REIT values. Fortunately, history shows that the belief that rising interest rates are bad for REITs value is a false assumption. The current doldrums for the REIT sector may likely end up as a great buying opportunity for future gains. Both Forbes and the NAREIT website note that historically, REITs have generated returns greater than the S&P 500 during periods of rising rates. How can this happen? As income investments, investors tend to lump REITs in with fixed income investments, i.e. bonds. When interest rates go up, mathematically bond prices must fall producing negative returns for bond investors. REIT shares are ownership stakes in businesses. Rising interest rates are usually the result of economic growth. For the REIT sector, an improving economy typically means rising commercial property values and the potential to increase rental rates. A significant portion of the REIT sector sees significantly greater benefits from economic growth than they experience from higher interest expense. These factors are especially true in the current market. Companies have had several years to prepare for higher rates. This means that well managed REITs have locked in low interest rates with long-term fixed rate debt. These REITs should be able to improve profit margins by boosting lease rates, even as they keep interest expenses low. 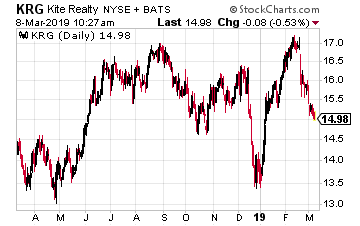 There are REITs to avoid. 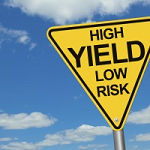 Stay away from any companies that have variable rate borrowing costs. These will see profits squeezed by rising rates. Avoid REITs that do not have histories of dividend growth. Part of staying ahead of rising rates is to own those REITs that can grow dividends faster than the increases in interest rates and inflation. With the recent retrenchment in REIT values, you can find shares with very attractive yields. The next step is to ferret out companies that will grow dividends at greater than the rate of inflation. Here are three to get started with. MGM Growth Properties LLC (NYSE: MGP) is a REIT that was spun-off by MGM Resorts International (NYSE: MGM) in April 2016. In the IPO, MGP received ownership to a larger portion of the MGM owned real estate, primarily casino hotel resorts. The properties are leased back to MGM Resorts on a long-term master net lease. Lease terms are very favorable for MGM Growth Properties. The master lease means that MGM makes a single lease payment and cannot get out of paying for individual properties. All new acquisitions from MGM are added to the master lease. The lease includes annual rent escalators and profit sharing from the portfolio resorts. The MGP dividend has been increased five times since the IPO and is forecast to grow by 8% in 2019. 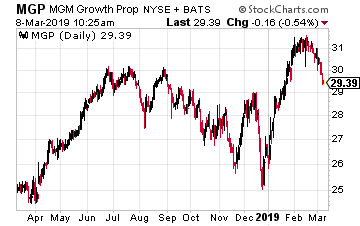 As the name states, this is a growth focused REIT. They have made offers on Las Vegas properties not owned by MGM. The stock currently yields 6.0%. Hotels are a commercial real estate sector that benefit from economic growth and can quickly pass along higher costs as higher room rates. 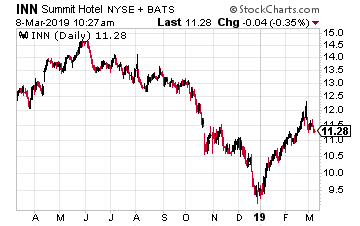 Summit Hotel Properties, Inc. (NYSE: INN) recently announced very good 2018 results, with expectations of continued growth in 2019. Revenue per Available Room (RevPAR) is the metric to watch with hotel companies. After two years of flat RevPAR, the metric took started to improve in 2018. Continued profit growth should lead to a 5% to 6% dividend increase this year. The current dividend rate is just 50% of FFO per share. The continued positive economic outlook should allow INN to grow dividends in the high single digit range. Kite Realty Group Trust (NYSE: KRG) neighborhood and community shopping centers in selected markets. These shopping centers are different from the malls and are integral to the function of the communities where they are located. These properties are anchored by internet-resistant tenants like restaurants, grocers, entertainment, and specialty stores. Kite Realty has been a steady 5% per year dividend growth REIT. This will not change even if the investing public gets negative on anything that looks like a mall REIT. In the retail sector, there are great differences between different companies and the types of properties they own. Kite Realty is an undervalued, stable dividend growth REIT. The current 8.4% yield makes KRG shares very attractive. President Trump has stayed busy signing 16 pieces of legislation that have ignited a massive $109 trillion income opportunity. But you must act fast, March 19th is the deadline to earn your first payment.